Blood Lust. Bloodless. Cyborg Death. Let’s face it; when it comes to naming his builds, Austin Tremellen from Philly’s Rogue Builds is a guy with some rather gruesome influences. 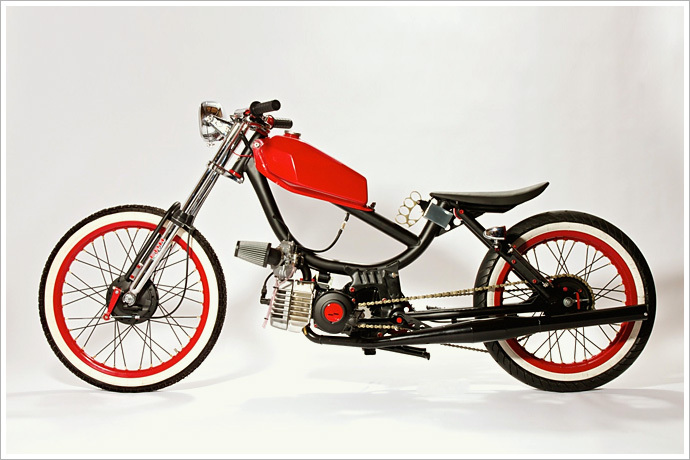 Sure, he builds some of America’s best mopeds, but we’re genuinely worried about him. Then we find out he’s named his latest build ‘The Oracle’. Harmless enough, you’d think. But do a little research and find out that in ancient times, ‘oracles’ were priests that told the future by gutting a bird and reading its entrails. So, the truth is obvious. Poor Austin is clearly possessed. We’re off to find an exorcist; you guys keep yourselves busy by reading on. 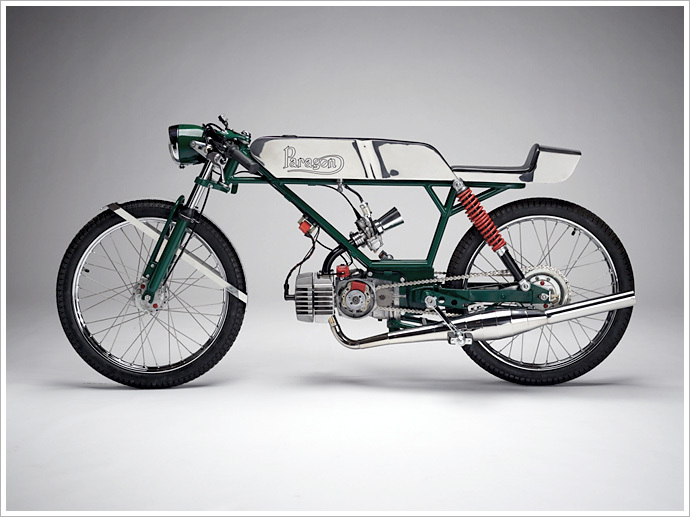 To build a custom bike is, in many ways, and exercise in knowing where to draw the line. It starts with small decisions, like whether that replacement carb you need is going to be new or reconditioned. Then it’s the off-the-shelf seat versus the bespoke leather one. 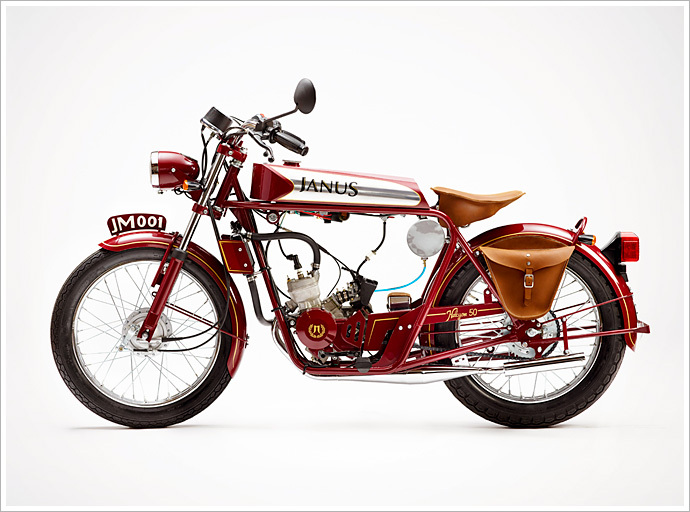 Soon you add up all the ‘little extras’ you’ve decided on and realise that if you continue down this particular road you’ll be riding the world’s most expensive two-wheeled vehicle; a two-wheeled vehicle that you’d be lucky to be able to sell for half the money you spent on it. But what if you didn’t stop? What if you had the time, money and patience to keep going? This is what. 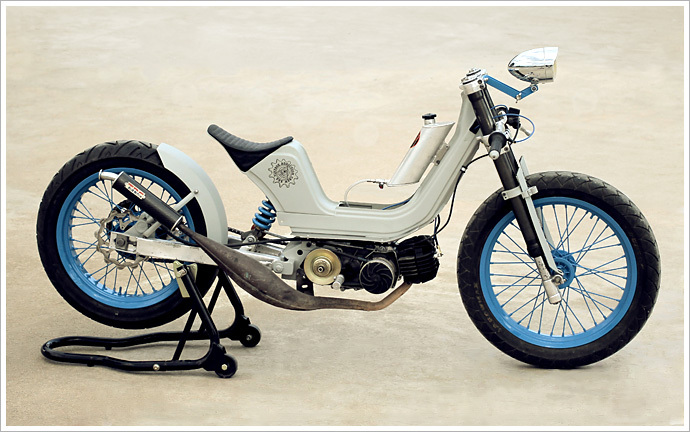 Meet what is quite possible the world’s most loved-up moped, Matt Turner’s Honda PA50. Modern life is rubbish. Or maybe it’s just us and our take on what we think matters in the 21st century. Whichever way you look at it, downtime in our lives has never been at more of a premium. We’re constantly online and never really out of reach. What’s the real casualty of this? For those of us that aren’t fortunate enough to work with bikes for a living, it’s our riding and building that suffers. And that’s because the finite amount of hours in the week means that the more we’re social media-ing and talking on our gadgets, the less we’re getting our hands dirty. The answer? Find more hours in the day. That’s exactly what Håkan Boqvist did. He realised that the lunchtime he spent staring into his Facebooks at work could be better utilised staring into oily metal componentry. And instead of building ‘likes’ or ‘friends’, he built this. Everything old is new again. The more we race towards the future with our iPhones and internets, the more we seem to long for a time when things were simpler. Cut throat razors are now selling better than they have in 50 years. 15 years ago, a hand-made leather wallet was something only Louis Vuitton and $500 could have got you. Now there are small leather makers popping up all over the place. And it seems like every man and his dog are doing a decent pair of jeans, although we remember when the only choice you had were 501s. 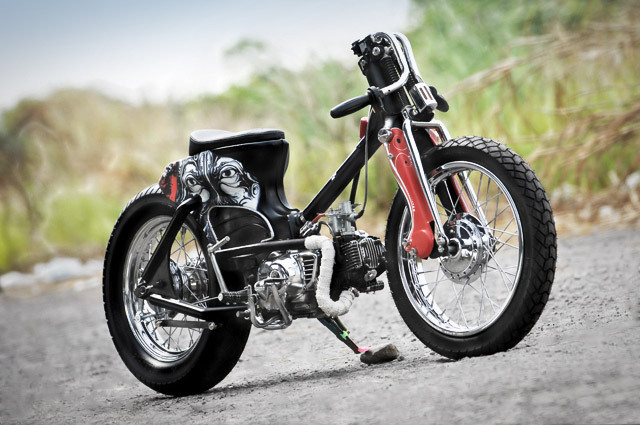 So what would happen if you took this bespoke, small-scale approach and applied it to build an entire motorcycle? 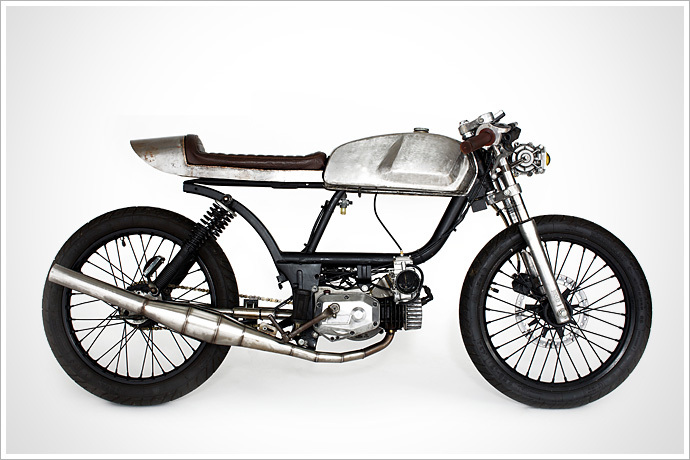 Enter Janus Motorcycles of Goshen, Indiana, and their wonderful Halcyon 50. 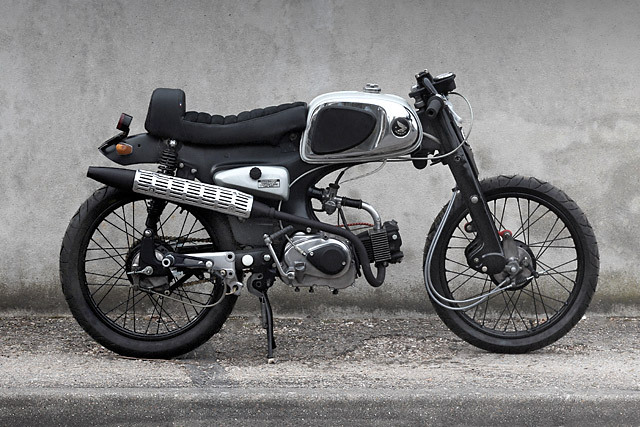 Another day and, hey presto, another killer ‘ped build. I’m not sure sure where they are all coming from, but our super computer calculations show that at this rate, every man, woman and child in the world will be tootling around town on a bitchin’ custom moped within the next 4.27 years. Scarily, the builds won’t stop there and look set to continue amassing until we reach a moped armageddon of sorts where it becomes us against them, man versus machine, in a nightmare-ish future that will see the bikes test mankind to it’s very limits by blocking out the sun with vast clouds of blue smoke, all while getting great gas mileage and being very convenient to boot. 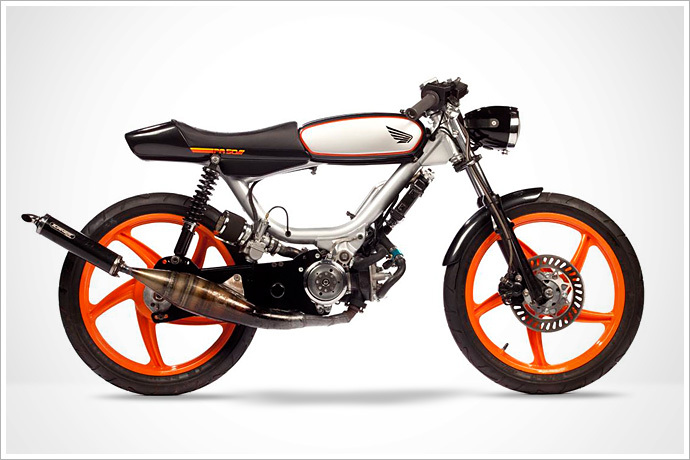 The leader of this future moped master-race will be none other than this exact bike; Motomatic’s “Yuba 2”. And deservedly so. I, for one, welcome our new low-powered overlords… and their creator, Nathan Kiehn. Christmas, 1982. Piallaway Road, Currabubula, North Eastern New South Wales. It’s a warm Saturday afternoon and I’ve decided in all my 11 year-old wisdom that I’m going to ride a motorbike as fast as it will go on a deserted public road with a complete lack of skills, safety gear, licence or fear of death. As the bike tears through the summer air I soon realise that the wind blast means that I can’t keep my eyes open, but the speed I’m travelling at means I can’t shut them either. I settle on a eyes-wide-shut squint. They begin to water profusely, which not only decreases my already limited vision to something now resembling being underwater, but has the added effect of creating copious amounts of tears which are almost instantly blown back into the hair above my ears. Still I fight on until I realise that the bike has no more left to give. The roar of wind in my ears is deafening, but within seconds it dies away as I back off and roll to a stop in the middle of nowhere, grinning like an idiot in almost complete silence. Well, technically speaking I probably WAS an idiot – a phrase which would be repeated many times over the next hour by my angry parents. 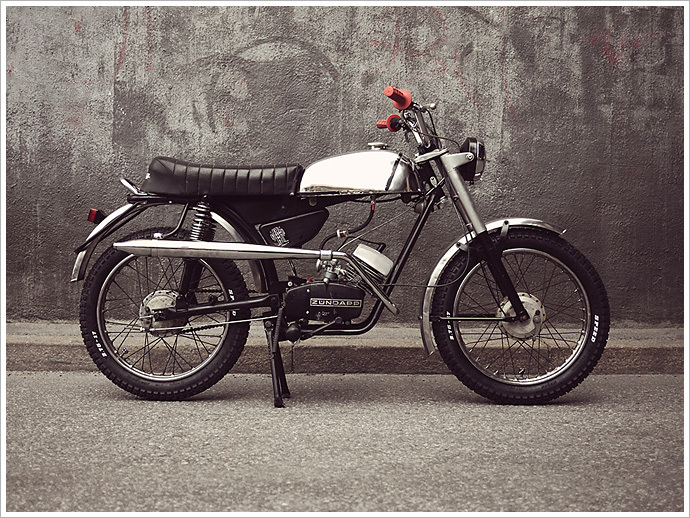 Thinking back, that was the exact point I fell in love with motorbikes. The bike I was on? 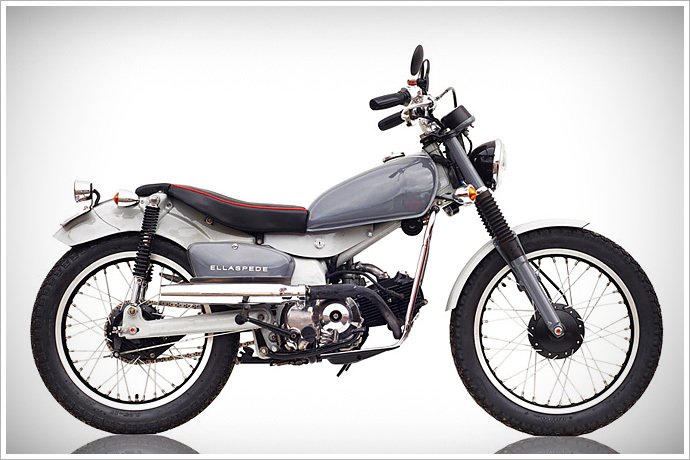 The Honda CT 110 “Postie”.